"inspire the creation, ensure the production and facilitate the distribution of enthralling, captivating, culturally relevant literary content by African writers and illustrators for African children". 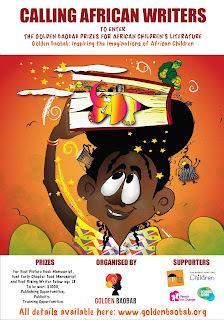 The Golden Baobab Prize for Picture Book: $1000 awarded for an African picture book (700-2000 words) for 6-8 years old. The Golden Baobab Prize for Early Chapter Book: $1000 awarded for an early chapter book (5,000 - 10,000 words) for 9-11 years old. Children's literature has the ability to nurture the imagination, but also excite young readers. What Golden Baobab is doing by inspiring both African writers and illustrators to create books for African children and young adults is amazing. They also work to showcase it on the world stage, which is even better - as that way children in other parts of the world might get the opportunity to enjoy these books, but also be introduced to new things. The 2013 prize is still open to eligible African writers of all ages. So if you're a writer, and one of children's literature, you can submit stories to any of the three prize categories above. You can find out more about the Prize on Golden Baobab's website. The deadline is 14th July 2013.